It's that great time of the year when many of the birds at Woodland Park Zoo begin to nest and raise chicks. By far the most unique species we breed is the tawny frogmouth. They look like owls, but they're actually relatives of nightjars (nighthawks, whip-poor-wills, etc.). This primarily nocturnal species is native to Australia, and the zoo has two pairs in an off-exhibit area for breeding purposes. 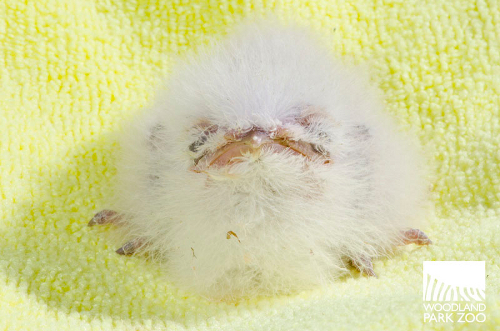 Tawny frogmouth chick at four days old. The ball of fluff in this photo is the fourth chick produced by a pair we received from the Taronga Zoo in Sydney, Australia in 2009. It hatched on May 17, and the parents are raising it on a diet of insects and small mice. When hatched, it weighed 0.6 ounces (17.5 grams). The small, white dot towards the upper tip of the bill is the egg tooth. This is what the chick uses to break the shell as it is hatching. 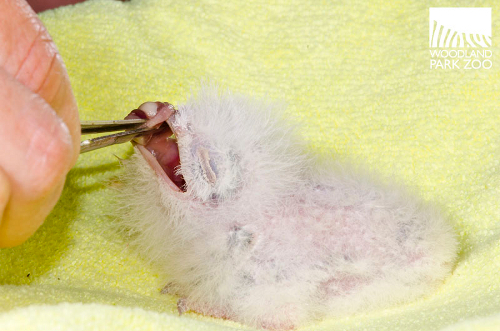 The egg tooth will eventually fall off as the chick ages. The frogmouth chick receives a little supplemental snack from its zookeeper during a daily check-up. The chick was quickly returned to its parents, who are doing an excellent job caring for it. The chick’s white, downy feathers will be replaced with mottled, grayish feathers that make frogmouths look like a dead branch when they are perched. This camouflage makes them very difficult to see in the wild and serves to protect them from predators. Our tawny frogmouth chick might not be the only fluff ball hatching this season. We have two more fertile frogmouth eggs being incubated by our second pair. 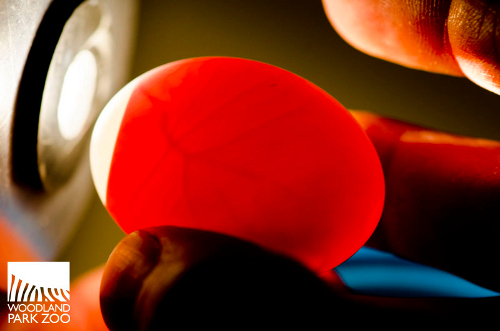 This photo shows one of the eggs being candled. When we candle an egg, it simply means that we hold it up to a high powered, focused light source for a few seconds to see if the egg is fertile or to check the health of a developing embryo. This frogmouth egg proved to be fertile—you can see the veins developing around the interior of the shell. These veins deliver nutrients (from the yolk) and oxygen (entering into the egg from the outside air) to the developing embryo. We expect this egg will hatch in another week or so. There are only 114 tawny frogmouths in U.S. zoos, and Woodland Park Zoo oversees the program which ensures the genetic and demographic health of the population. This program will ensure that we have frogmouths in our zoos for many years to come.